Do YOU Own Any Platinum? Should You? We want to look at how to buy Platinum coins and bars because, like Platinum itself, information on the coins and the coins themselves are harder to find than their counterparts in gold or silver. Platinum is much more rare than gold, but is often overlooked by people buying and storing gold and silver coins and bars as being simply an industrial metal. While it is true that over half of platinum production is destined for uses in automobiles and other industry, investing in Platinum can be very profitable at times too. Similar to Silver, but unlike Gold, industrial use does effect the price of Platinum and is a factor to consider before buying Platinum coins or bars. Recessions, especially in the auto industry, tend to push the price of this rare metal down. Yet for many investors, the search for Platinum coins or bars to add to their precious metals portfolio can be frustrating. One reason is that the Platinum coins and bars can be harder to find than going out with a pick and shovel and trying to find the raw product itself! And like Silver coins, Platinum coins where absolutely unavailable for sale in the financial crash of 2008 when we saw spot prices of Silver at under $10 per ounce and Platinum in the $800 per ounce range. Since this was before the Platinum ETF, there simply was not a good way to buy physical Platinum and take advantage of the fire sale pricing. There are two basic ways to buy Platinum (not including an ETF; not including jewelry which we consider to almost never be an investment – at least not if you give it to an American woman; other cultures, maybe). Several sovereign Platinum coins have been produced over the years, but production at any given time varies quite a bit, most likely due to the fluctuations in retail demand. With the list of Platinum coins below, it may not be exhaustive, but lists the most popular recent coins for sure. Some coins and some sizes of coins have not been minted every year. MOST of the coins listed above you will NOT find readily in stock for you to buy. 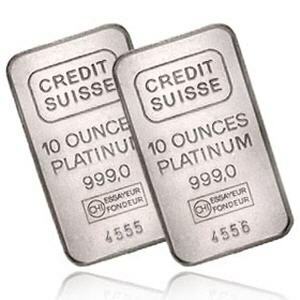 Platinum bars may be available in gram sizes or ounces. Again, brand of refiner and sizes available at any given time can vary quite a bit. The disadvantage to buying Platinum bars instead of coins is that they need to be assayed when you sell them. However, all bars we have seen for sale in gold, silver or platinum are always in a sealed mint package with assay information, so we consider bars to be a slightly less expensive alternative to the sovereign coins without any real disadvantage as long as you buy them sealed with a respected, reputable assay card. First, you have to have an IRA custodian that will hold the Platinum coins or bars for you. Chances are, you may have to let them buy them too. A custodian such as with an “Open Opportunity IRA” may allow you to buy them, even arrange for storage, but we have not done this. The duration and the maximum temperature of a fire in a building compartment depends on several factors including the amount and configuration of available combustibles, ventilation conditions, properties of the compartment enclosure, weather conditions, etc. In common circumstances, the maximum temperature of a fully developed building fire will rarely exceed 1800°F. The average gas temperature in a fully developed fire is not likely to reach 1500°F. Temperatures of fires that have not developed to post-flashover stage will not exceed 1000°F. Many people have commented on forums and other discussions that you need a good fire proof safe to protect your precious metals. Well, even if a home fire gets hot enough to melt your Gold (1064.18 °C, 1947.52 °F) and Silver (961.78 °C, 1763.2 °F), the worst you would have to do is separate it from the other rubble in the building, have it re-fabricated into bars that can be assayed (Yes, costly hassle). Again, though, according to AISC, that won’t happen with Gold and is extremely unlikely to happen with Silver either. Certainly that won’t happen with Platinum! It doesn’t tarnish either, like Silver does. Should you decide to buy Platinum, take delivery and store it at your home you have about the same options as with Gold. The (current) price pers ounce is close enough to Gold that the value to size metric is similar (unlike Silver where storage space & weight is significantly higher than Gold). Surprisingly, one of the best deals in a home safe that has a great fire rating is the Little Titan safe. We mentioned above about the need to assay a Platinum bar when it comes to selling, but that assay cards are typically included in the plastic sealed container that the bar comes in. Well, in case of a fire, the PLATINUM won’t melt or burn but the ASSAY CARD will. Just saying. If you are not going to store your Platinum at home (and I’m not suggesting you do because of all the above mentioned and inferred risks) then why not store Platinum offshore using one of the same trusted services that allow you to buy and store Gold offshore (and Silver and Palladium)? You can also buy and store Platinum with a service like GoldMoney. The key difference is that your metal is in portions of a bar shared with others whereas with Hard Assets Alliance or GlobalGold there are coins and bars that are yours. There are a number of trustworthy companies that allow you to buy Platinum online. Some of these we have personally done business with. In some cases you can buy the Platinum coins or bars and have them shipped, some allow you to store them, some allow you to store them and take delivery if you wish any time in the future. 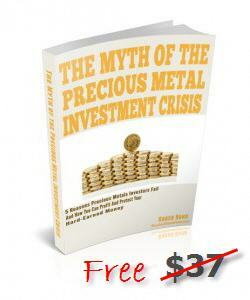 When buying Platinum coins or bars don’t just look at the cost of the metal but also the cost of the transaction. Some companies may require (or prefer) a wire transfer which could cost you $15 – $50. A few of those companies – if you ask – will reimburse you for the cost of the wire, so ask! Shipping and insurance is also a factor, and, the fewer coins or bars you buy the larger a factor it is. Platinum isn’t going to have the obscene shipping costs of Silver but make sure you know to compare companies. Many will include the cost of shipping and insurance while others tack it on for you to pay. Also check for minimum order quantities. The company that might sell the cheapest Platinum coin online might require a minimum of 10 ounces or some level of order value beyond your means. Here is a list of companies we have either used or are aware of that sell Platinum bars and coins online or psuedo-online (may require a phone call). We hope this information is helpful for how to buy Platinum coins and Platinum bars. I bought my first Platinum coin, an Australian Koala, back in the mid-90’s and paid around $600 for it so I know that price appreciation is definitely a possibility. Understand, though, that Platinum can be more VOLATILE than Gold and for quite some time was MORE EXPENSIVE than Gold, so there are risks as with all investments. Knowing how and where to buy Platinum is key to making money. We learned a long time ago that you make money when you BUY (by getting in at the right price) not when you sell. If you do take personal delivery of your Platinum, then enjoy; the coins (and even the bars) are very attractive.